Thursday's vote could have a large impact on the English game, should the referendum to leave pass. A day from now I’ll find out if I’m still European. A referendum on June 23 will offer Brits the chance to leave the European Union and break the ties that bind us to the Continent. But more is at stake Thursday than my own national identity crisis. The British electorate holds in its hands, among other things, the future of the world’s biggest soccer league. There are around 200 European players in the English Premier League and hundreds more in the three pro soccer leagues that sit below the top flight—in comparison, the NBA boasts only about 100 international players. Those numbers include Chelsea midfielder Eden Hazard (from Belgium), Manchester United goalkeeper David De Gea (Spain), and Arsenal midfielder Mesut Özil (Germany). Most of these Europeans come from one of the EU’s 28 member states, and have the right to live and work anywhere within the union without the need for work permits. The EPL has flourished in this open-borders environment. Over the 2014-15 season, it pulled in $4.8 billion in revenue, more than twice that of the next two biggest soccer leagues combined, Germany’s Bundesliga ($2.6 billion) and Spain’s La Liga ($2.1 billion). In 2015-16, domestic and international TV rights alone brought the EPL $2.5 billion, and next season that will jump to $3.9 billion. But all is not right with English soccer. While the Premier League has soared, the national team has stalled. In 1996, England reached the semifinals of the European Championship. Since then it has gone no further than the quarterfinals of either that or the World Cup. Twice England failed to escape the group stage of a major tournament. Once it failed to even qualify. In that same time period, three of our most ancient enemies, France, Germany, and Spain, won both the European Championship and the World Cup. In what turned out to be a sign of things to come, Jamie Vardy scored the club's first goal 11 minutes into the season and Riyad Mahrez scored two of his own to give Leicester a 3-0 lead 25 minutes into a 4-2 win over Sunderland at King Power Stadium. Riyad Mahrez answered Dele Alli's 81st-minute goal a minute later, and even though Leicester suffered its first non-win of the campaign in the 1-1 home draw against Tottenham, it showed a promising resiliency against a club it would be fending off down the stretch. Facing a 2-0 deficit at home to lowly Aston Villa, Leicester mounted a furious comeback, with Ritchie De Laet, Riyad Mahrez and Nathan Dyer scoring in the 72nd, 82nd and 89th minutes, respectively, to steal three points in dramatic fashion. Again down 2-0, Leicester rescued another point from a losing position at Stoke City. The Potters raced out to their lead within 20 minutes, but Riyad Mahrez's penalty and Jamie Vardy's 69th-minute equalizer salvaged the point. Leicester found itself down 2-0 to Southampton (sensing a theme here?) but roared back late. Jamie Vardy scored twice, once in the 66th minute and the dramatic equalizer a minute into stoppage time, earning the Foxes another point from a losing position. It took 10 games and a promise of a pizza party from manager Claudio Ranieri for Leicester to keep a clean sheet, but the Foxes did just that in a 1-0 win over Crystal Palace. The pizza promise became an instant part of Leicester lore, and the club went on to keep 14 more clean sheets–including six in seven games down the stretch. Jamie Vardy set a Premier League record scoring in his 11th straight game in a 1-1 draw vs. Manchester United. Ruud van Nistelrooy previously held the mark. With manager Claudio Ranieri facing Chelsea–the team that ushered him out in 2004–and squaring off against Jose Mourinho–the man who replaced him–Leicester wound up with the bragging rights and three points. Jamie Vardy scored off a perfect Riyad Mahrez pass, Mahrez added a gorgeous goal of his own, Leicester won 2-1 and Mourinho was promptly fired. On the heels of a Boxing Day loss to Liverpool, Leicester proved its title chops by holding contender Manchester City to a 0-0 draw. Kasper Schmeichel made a pair of key first-half saves, and Leicester bounced back three days after the setback to secure a meaningful point. Defender Robert Huth's perfect 83rd-minute header from Christian Fuchs's corner–his first goal since last April–gave Leicester a 1-0 win over Tottenham at White Hart Lane, snapping a three-game winless run. Given how the title race would come down to the two clubs, the point swing has proven to be massive. 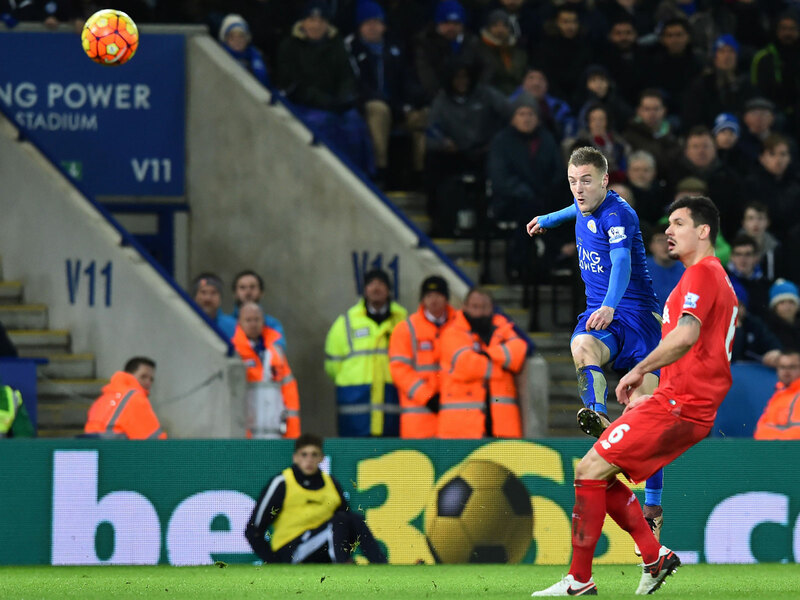 Jamie Vardy scored twice in a February win over Liverpool, but it was his first goal that had the world talking. After running down a long ball from Riyad Mahrez, Vardy unleashed a 25-yard volley off the bounce to stun the Reds and help Leicester exact revenge for one of its three losses on the season. A match at Manchester City was supposed to be the start of Leicester's downfall, but the Foxes were having none of that. Robert Huth scored in the third minute to shock the Etihad faithful, and he added another later to proclaim Leicester's intentions in a 3-1 win. 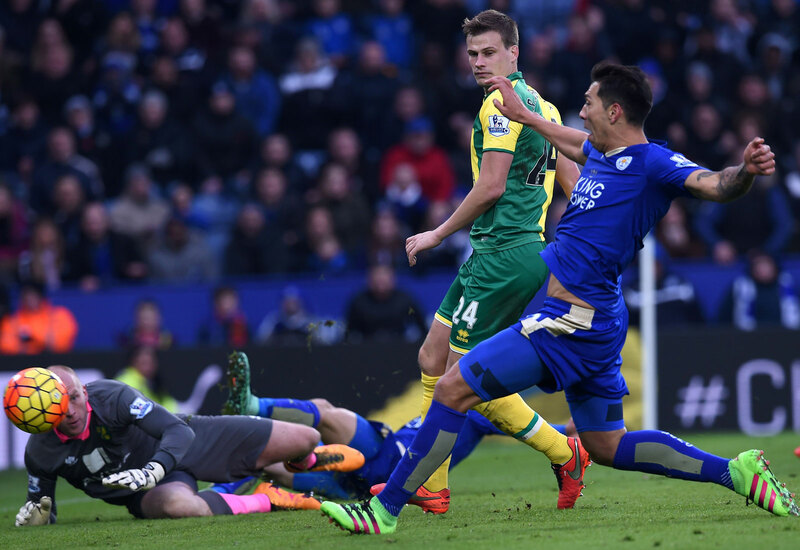 Both times Leicester lost to Arsenal it followed up with wins over Norwich City to right the ship. 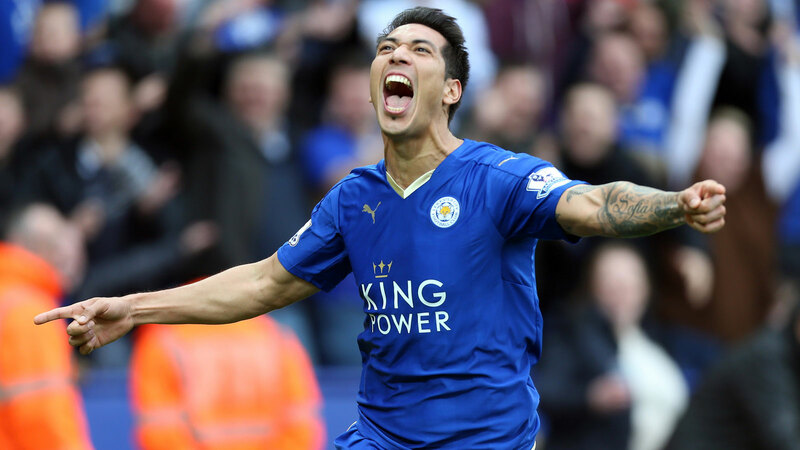 The second time was far more thrilling, with Leonardo Ulloa scoring an 89th-minute winner at King Power Stadium to put the title ship back on course. Not that it was ever remotely in doubt, but Leicester ensured safety from relegation with a 2-2 home draw vs. West Brom. Given Claudio Ranieri's cautious approach to overstating goals, the preseason expectations and last season's heroic charge out of the drop zone, the achievement was still notable and allowed Leicester to officially look ahead to bigger things. 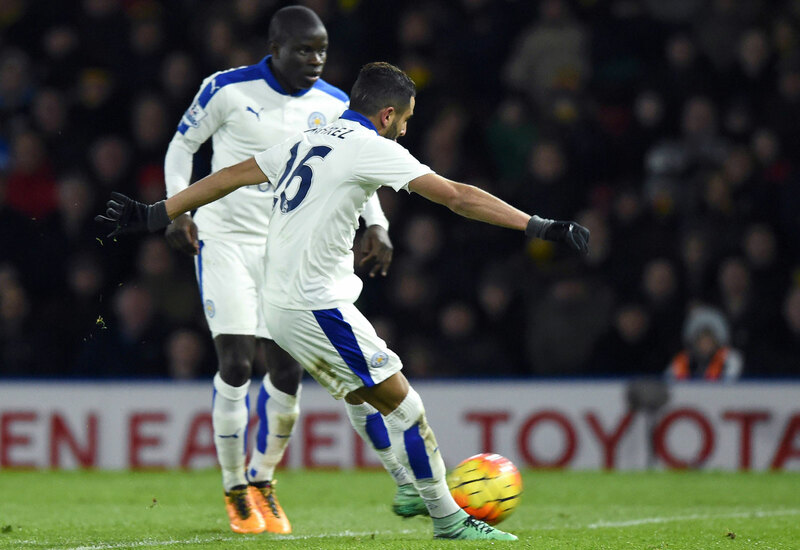 Vital midfielder N'Golo Kante returned from an injury and Riyad Mahrez scored a highlight-reel goal–again–as Leicester won at Watford 1-0 to keep pressure on Tottenham and Arsenal in the title chase. The club's record away from home (11-2-4) is a big driver of its overall success. 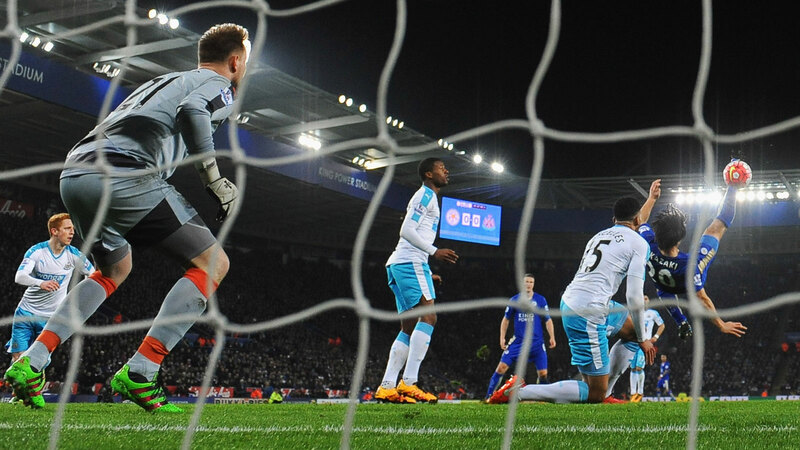 Shinji Okazaki's bicycle kick goal gave Leicester a nervy 1-0 win over Newcastle on a day which Leicester entered leading Tottenham by just two points in the Premier League table. 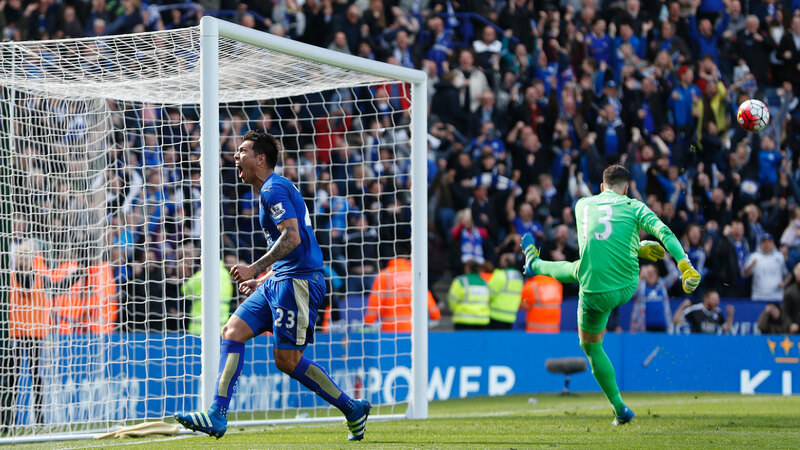 With Tottenham dropping points to Liverpool the previous day, Leicester took full advantage. 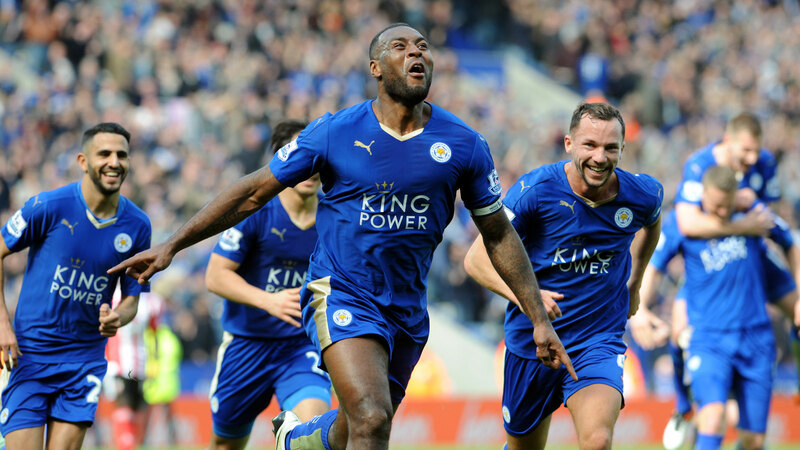 Defender and captain Wes Morgan scored his only goal of the season in a 1-0 win over Southampton that stretched the club's lead atop the table to seven points. 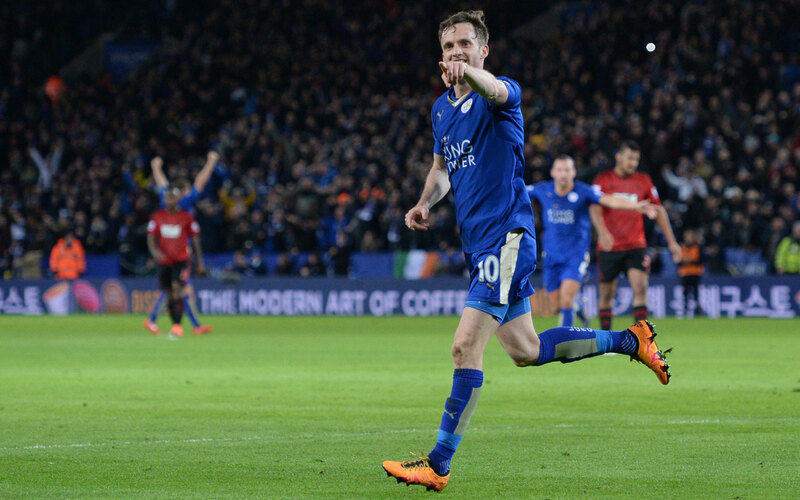 It went overlooked given the club's title aspirations, but Leicester clinched an almost equally improbable place in next season's Champions League with a 2-0 win at Sunderland, cementing a top-four place. Jamie Vardy's two goals did the honors. Leonardo Ulloa calmly converted a penalty kick deep into second-half stoppage time to cap a game full of controversy and secure a vital point in a 2-2 draw with West Ham. With leading scorer Jamie Vardy suspended because of a referee altercation in the previous match vs. West Ham, Leonardo Ulloa stepped into the starting lineup and scored twice in a 4-0 rout of Swansea City. A Tottenham draw the following day put Leicester in position to clinch the title with three points from its final three games. Leicester players gathered at Jamie Vardy's house to watch Chelsea take on Tottenham in the decisive match in the title race. It was the Vardy Party to top all Vardy Parties, as Leicester was crowned champion following the 2-2 draw at Stamford Bridge. 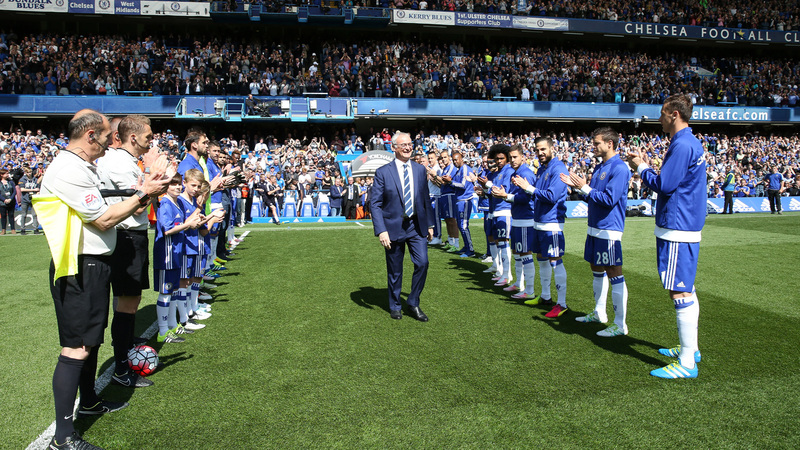 Claudio Ranieri returns to Stamford Bridge, where he was jettisoned in 2004 for Jose Mourinho, and steps through Chelsea's guard of honor, which the outgoing champions provided for Leicester City. Perhaps that will all change at this summer’s European Championship. England was the only team to qualify with a perfect record (10–0–0), but on June 11 opened with a 1–1 tie against Russia (ranked No. 29 in the world by FIFA, or 19th out of the 24 teams at Euro 2016). Last Thursday it relied on an injury-time goal to win 2–1 against Wales (No. 26 in the world, 16th at Euros), and it closed group play Monday with a 0–0 draw against Slovakia (24/15). Or perhaps 2016 will be yet another painful chapter in English soccer history. "Vote leave, take back control," urges the campaign for Brexit, tapping into fears of lost independence, and laying the blame for British woes at the feet of the European Parliament. In soccer terms, foreign players are accused of taking jobs and opportunities from homegrown talent. If you were ever unsure of how dangerous stoking xenophobia can be, consider the brutal murder of British MP Jo Cox last Thursday. Appearing in court two days later, her alleged killer, Thomas Mair, gave his name as “Death to traitors, freedom for Britain.” Or consider the soccer violence that has made headlines almost every day of Euro 2016 so far. In May 2015, the British Government tightened up work permit rules in order to reduce the number of international players in the UK. At the time, Greg Dyke, chairman of England’s Football Association, explained that the new rules would “make it far tougher for those who don’t meet the quality standard to get to play in Britain.” What the FA couldn’t do, until now, was prevent the influx of EU citizens; a vote for Brexit would do just that. However, no one really knows what effect that might have. Access to the international talent pool raises the standard of play in the EPL, and foreign players bring with them foreign fans, sponsorship deals, merchandise sales, and TV money. The league is too big and powerful to simply disappear if that lifeblood is constricted, but it could lose its place at the top, out-competed by leagues that still have access to Europe, such as the Bundesliga and La Liga. “We, in the UK, must be in Europe from a business perspective," said Richard Scudamore, CEO of the EPL, last October. On Tuesday, former English soccer player and UNICEF Goodwill Ambassador David Beckham threw his support behind the Remain campaign. “For our children and their children we should be facing the problems of the world together and not alone,” he wrote on his social media channels. Besides, if English players are being shunned by the EPL, that is a sign of a lack of English talent, not foreign bias. Spain has three times more soccer coaches than England; Germany has twice as many. (Based on UEFA coaching statistics from 2013, and adjusting for the size of each country’s under-20 population.) Better youth soccer development programs, not fears about immigrant workers, make a far more convincing case for why Germany and Spain won the last two World Cups. Raising the drawbridge that connects Great Britain to Europe, just like building bigger castle walls, will almost certainly work to keep more foreigners out. But isolation won’t make English soccer great again.